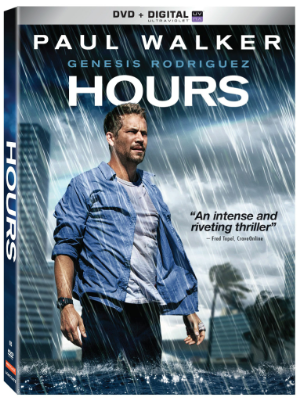 Paul Walker (The Fast and The Furious franchise) reinvents himself, in one of his last roles, in the pulse-pounding drama, Hours, arriving on DVD (plus Digital UltraViolet) and Digital HD March 4 from Pantelion Films and Lionsgate Home Entertainment. The dramatic thriller also starring Genesis Rodriguez (Casa de mi Padre, The Last Stand) is written and directed by first-time director Eric Heisser. Nolan Hayes (Walker) arrives at a New Orleans hospital with his pregnant wife, Abigail (Rodriguez), who has gone into early labor. Things quickly spiral out of control when the birth goes tragically wrong and Hurricane Katrina hits, ravaging the hospital and forcing an evacuation. With his baby dependent on a ventilator and no one around to help, Nolan faces one life-and-death decision after another and must fight to keep his daughter alive. Featuring a music video by Safran and a PSA for Paul Walker’s charity Reach Out World Wide, the Hours DVD (plus Digital Ultraviolet) will be available for the suggested retail price of $19.98. Hours is currently available on Video on Demand and Pay-Per-View. Materials © 2014 Pantelion, LLC. All Rights Reserved.